Princeton University’s Department of Public Safety has determined that a hammer hitting a chisel during a repair on Nassau Hall was the likely sound that was interpreted as gunshots and reported to them on the evening of Tuesday, Oct. 8. 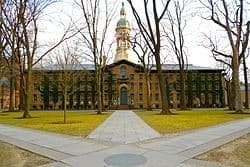 While conducting a follow-up investigation on the incident that shut down Nassau Hall for about two hours, public safety officials at the school learned that about 20 minutes before the call about the gunshots was made Tuesday, a maintenance worker was using a hammer and chisel to fix a door on Nassau Hall. The worker made the repair and left the building before an employee inside the building called to report the sound to public safety. The public safety department has determined that it is highly likely that the sound of the hammer hitting the chisel was interpreted as a gunshot. The matter is now closed, school officials said. Ominsky said campus community members are encouraged to report behaviors of concern, following the Homeland Security advice — “If you see something, say something.” The public safety department at the school has officers and dispatchers on duty 24 hours each day, seven days each week. They can be reached at (609) 258-1000 or (609) 258-3333 for emergencies. The person who reported this should be investigated and given a mental health examination…. If this had been a campus even remotely near an urban area, or had students/faculty familiar with urban areas, this never would have happened. Wait, so all the sheltered Ivy kids didn’t know what an actual gunshot sounds like, compared to any generic loud retort? I am shocked – SHOCKED, I tell you. God forbid a car backfire. And that required an hours’ worth of a helicopter circling a wide swath of Princeton. I wonder how much that much cost. Talk about overkill. Thanks for the update to the mystery PP – yer da best!